At first, I was going to post about She & Him strictly because I find Zooey Deschanel irresistible. Then I read this NY Times article and listened to their free download and found it, well, irresistible. Imagine that - posting about music on a music blog because of the music. I'm nothing if not an innovator. Now she is showcasing her harmony-loving side in a new band, She & Him, with the singer-songwriter-guitarist M. Ward. Their debut album, “Volume One,” is a collection of vintage-sounding country-tinged songs written mostly by Ms. Deschanel and produced by Mr. Ward. Released last month on the indie label Merge Records, it has received surprised acclaim from magazines and blogs alike. Her voice is uber-cool and M. Ward's music is top-shelf, even with some Beatley vibes to boot. I feel guilty listening to this with headphones on a crappy computer because it would be much better with headphones on a crappy turntable. Her voice is uniquely mid-20th century and his music is decidedly worthy of airplay in the oughts. It's not my normal taste, but what fun is music if we can't push our own limits! 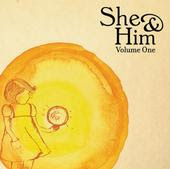 I'll be examining She & Him a bit more, this time for the music.